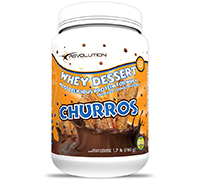 Revolution Nutrition™ shakes up the whey protein world with Whey Dessert! Reward yourself by turning your post-workout protein shakes into an indulgent dessert. Whey Dessert is the first-ever "real dessert experience" protein! This incredibly delicious protein formula perfectly re-creates the taste of your favorite desserts -- guaranteed! With the most amazing flavors to choose from, Whey Dessert satisfies your sweet tooth cravings while meeting all of your protein needs. Whey Dessert uses Flavor Pearls to give you true, authentic dessert tastes. What could be more rewarding after a classic cardio workout than a classic Chocolate Mint Ice Cream protein shake? What about Matcha Latte after Yoga? Or bring your boot camp workout back to camp with the taste of S'mores! With 6 flavors to choose from, Whey Dessert is the ultimate reward whatever your workout regimen. Whey Dessert is easily digested and faster absorbed, which means it can enhance muscle protein synthesis, speed tissue repair and may be useful for accelerating muscle recovery after exercise.1 Studies show whey is healthy and, over time, can reduce total cholesterol and increasing HDL. Furthermore, studies have shown that whey protein can also lead to reductions in blood pressure, inflammation, and oxidative stress.2 Whey protein is a better option than other proteins for inducing protein synthesis and aiding in fat loss. Due to its efficacy, whey protein produced a greater insulin response, reduced appetite, indicating a potential for appetite suppression and weight loss in some individuals.3. Simply mix 1 scoop (39 grams) of Whey Dessert in 4 oz of cold water. Shake well and consume immediately. To preserve Flavor Pearls, do not use electric blender to mix.